When you watch a great movie, you’re watching a collaborative effort, but one that SOMEbody (usually the director) oversees and marks with his or her creative stamp. In comedies, more so that any other art form, timing is essential. Just one frame (a 24th of a second) can make a recognizable difference in the timing of a joke. That brings me to the hatchet job AMC did on Blazing Saddles. [Read more…] about [BLEEP] This. For those of you who are curious, I’m still in Shreveport, taking care of my Dad. Not much more to report. I’ll be back – and back writing, when I can. For those of you that are regular readers of this blog, you might wonder, “Where’s Captain Digital?” The answer is, I’ve been busy, taking care of family stuff. And unfortunately, I’m not yet done. I’d love to tell you all about it, and someday, perhaps I will. Suffice it to say that family’s gotta come first. Of course it didn’t help that I expected to have web access here, and that didn’t happen until late last night/early this morning. I’ll be back sometime soon, I hope. In the meantime, please forgive me if I’m not able to post as often as I’d like. Gov. 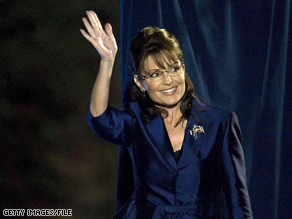 Palin: You say "Goodbye"...I say "Hello!" We are all, at one level or another, creatures of habit. That’s a good thing, most of the time. I mean, if we woke up to a world everyday where we had to figure out how to feed and clothe ourselves, with no idea of what would come next, none of us would leave very productive lives. But there’s a dark side to habit – that being the phenomena whereby we attempt to pigeonhole everything that happens, so we can process it, understand it (in terms of previous experiences) and move on. This system of shorthand evaluations doesn’t work at all, however, when you run smack dab up against something new. New is…different. It doesn’t fit the mold. It doesn’t lend itself to snap analyzes, or fitting into patterns. But “new” is where innovation comes from. It’s where solutions come from. And it’s where our future lies. Consider (soon-to-be former) Gov. Sarah Palin. [Read more…] about The UN-candidate. Michael Jackson and web traffic. Tragic figure, or train wreck? I gotta say I’m floored. I write two blogs – one on marketing (blog.grokmedia.com) and this one on politics, pop culture, and whatever else interests me. The other day, I wrote a post on the phenomenon surrounding the death of Michael Jackson. Let me just say that I’ve NEVER seen anything like the kinds of numbers I’m getting on my visitor logs like I’ve seen since Jackson’s death. I’ve seen – and I’m NOT exaggerating – an uptick of approximately 1,000 times more hits. And I’m not alone – Google originally thought that the search hits they were getting on “Michael Jackson” was a coordinated denial of service (DoS) attack. Nope. Just millions of people, searching for anything and everything they could find on the subject of Michael Jackson. My question is, “why”? I mean, sure, Jackson was a pop superstar (emphasis on the word “was”), but are you seriously telling me that he’s THAT popular now? Here are the possible reasons I can fathom for the current fascination with Jackson: [Read more…] about Michael Jackson and web traffic.